I’m not to tell you about myself in the first post…there is a separate page up above for that. I will, however, tell you about my gym shoes!! The pic above (which is the same pic as the main blog pic) are my current sneakers in rotation. The ones on the left are my Asics….they’re for running (which I haven’t been doing much of cuz of my ankle…more on that ish later). The middle shoes, the Nikes, are the oldest things on the planet and I use them for biking. 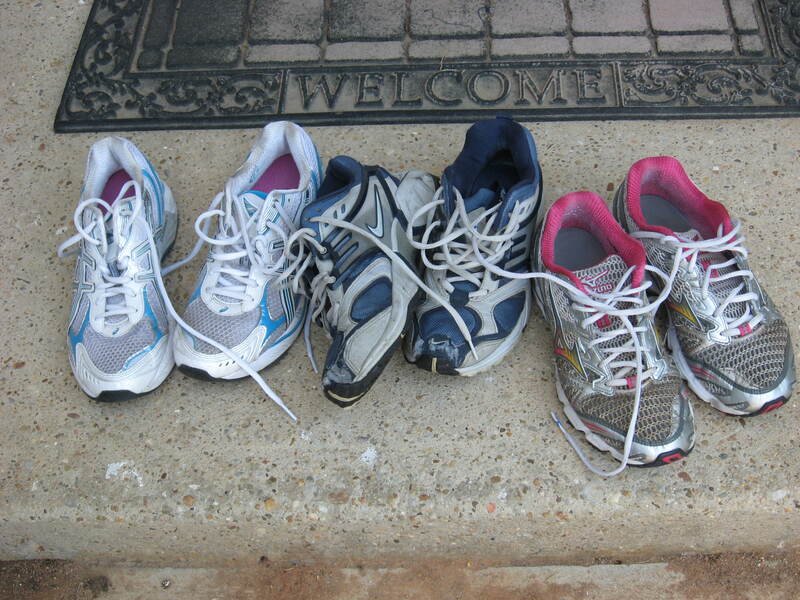 The shoes on the right are my beloved Mizunos…I used these when I first started running, but now they’re my gym shoes. You’re not supposed to keep running/gym shoes too long!!! You’re right….my physical therapist nearly had a heart attack when I showed him my old running shoes. unless someone sends me a money tree I don’t know about that 3 month thing….the shoes I bought to train for my triathlon are more than 3 months old now and I have no intention of replacing them just yet!